George Lake and Glen Acorn, who played with trumpeter legend Chuck Barber, continue to wow the crowds fifty years later -- long careers, and still going! We wouldn't be surprised if they both still travel around with their 1953 Trocadero Ballroom business cards! Those of you who knew and remember Mac will recall a very fine jazz pianist who was greatly influenced by the style of the late Oscar Peterson. Mac knew all the tunes, was seldom if ever stumped. 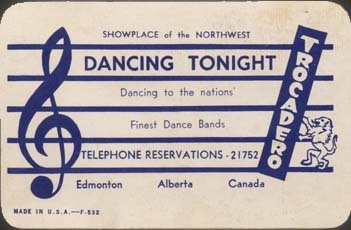 Mac had an extensive career here in Edmonton dating back to the Chuck Barber Orchestra at the old Trocadero Ballroom (where I first met and played with him), through to memorable spots such as Chicks Bar B Q on Hwy. 2 where he gathered together Howard Guloien, Freddie Smith, Tommy Doran and myself, a group which lasted some 4 or so years prior to all of us moving over to open the new Derrick Golf and Country Club. Mac's group played the Derrick for 9 years after which we gigged at the old Shasta on Jasper Av. Mac, as a Trocadero Ballroom alumni pianist, was invited to join the Trocadero Alumni Orchestra which is now in its 23rd year and still active. He remained with the big band for 3 years before accepting gigs as a solo (electronic) keyboard artist. He eventually retired due to ill health. Mac was a Life Member of loc. 390 AFM and will be greatly missed by those of us who worked many years and gigs with this remarkably talented gentleman.